In lieu of flowers, the Keogh family has requested donations be made to support programming to bring authors and illustrators into Boston schools. The world of children's books has lost a passionate champion with the passing of Pat Keogh on May 2, 2018. Pat's love of children's books began in her career in elementary schools, particularly as a school librarian in the Weston, MA public schools, where she spent 40 years. That love grew outward to include teaching children's literature at the college level, being a dynamic presenter at countless professional gatherings of her peers, and working tirelessly for 25+ years to advance the mission of Wondermore. 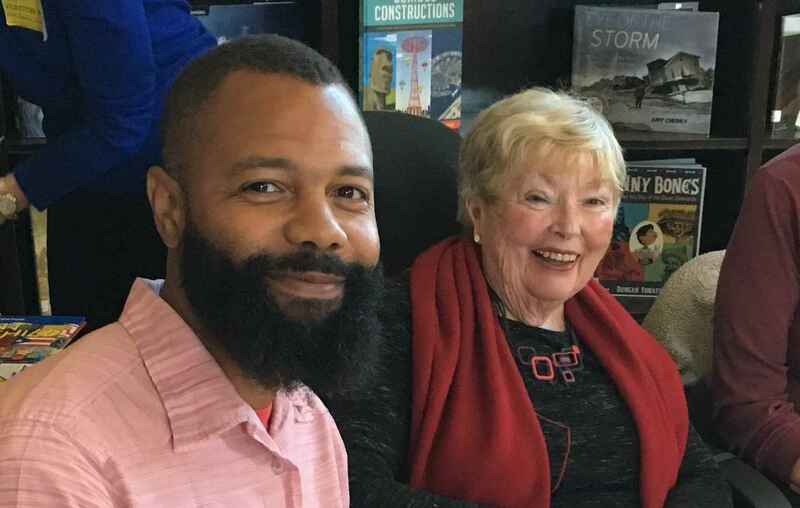 As an early and powerful advocate for diversity in children's literature, Pat worked hard to creating opportunities for authors to visit under-served classrooms in Boston. Over the years, Pat befriended and fostered the careers of many children's book creators, including many new to the field. Her work in children's literature was recognized in 2016 when she was awarded the Peggy Hallisey Lifetime Achievement Award from the Massachusetts School Library Association. Pat served as a past president of Wondermore and for many years co-chaired our Program Advisory Committee. We already miss Pat, her outspoken enthusiasm, and her staunch support of all things related to children's books. A friend of Centerville's Captain David Kelley House, Pat was alway an inspiration & joy. It was with great sadness that we learned of her passing. Pat's Wordfest program in Weston led to a dynamic collaboration of principals, teachers, authors, students and parents who valued reading and writing. Pat Keogh was a remarkable woman with a magnificent spirit. We adored her. In honor of Pat Keogh, who's passion for education will continue after her passing. Our deepest condolences. Read to a Child, a Boston nonprofit organization, pays tribute to Pat for her joyful attitude and professional guidance over the years. Pat Keogh was an inspiration to students, authors and illustrators. As an Alaska author, she welcomed me to the Boston community with great support. In memory of Patricia Keogh an outstanding and inspirational educator. Gareth Hinds & I each benefited greatly from Pat's enthusiasm for books and her support of fellow book lovers. She was a blessing we will truly miss. To honor and celebrate the generosity of Patricia Keogh in promoting literacy throughout our city. From President Healey and the Board of Trustees at Babson College - where Patricia's brother, William Markey, is a member of Governance. We were so lucky to have Pat as a colleague and friend. I'll really miss her wicked laugh and her smart, passionate opinions on just about everything! In Honor of Pat, may your passion and belief in the power of literature to transform continue. You were wonderful to work with. So sad to hear about Pat's death. The world of children's books has just gotten dimmer without her to help breathe life onto reading sparks of kids. I loved working with Pat at The Foundation For Children's Books and enjoyed her knowledge, humor and dedication to the field we loved so much.